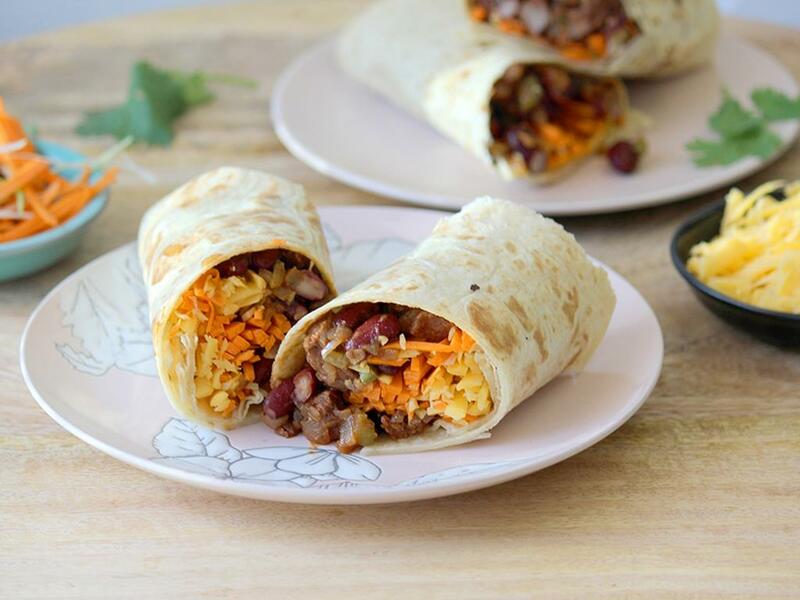 Worcestershire & tomato sauce coated beef cubes & kidney beans served in a warm toasted wrap. Carrot matchsticks: Cut in half crossways. Then cut each half lengthways into thin slices (2mm thick) and cut each slice into very thin matchsticks (2mm). Beef & kidney beans: Remove any hard sinew (white parts) and cut the beef cubes into smaller pieces. Mix them with the Worcestershire sauce and tomato paste and season with salt and pepper. Place a pan on medium-high heat with a drizzle of olive oil. Add the onion and celery with a pinch of salt and pepper and fry for 5 minutes. Add the beef and sauté for 3-5 minutes until lightly golden, then add the garlic and kidney beans and cook for another 3 minutes. Mix in the honey and season with salt and pepper to taste. Wraps: Place in a dry pan on med-high heat and warm for 30 seconds a side (don’t over toast them, or they will break when you wrap them – you just want them warm). To assemble the wraps, top with the beef & kidney beans, cheddar cheese, carrots, spring onions and fresh coriander leaves. Tuck in the ends of the wraps, the roll them up and cut in half. "These were delicious! The combo of ingredients was really nice. Easy to cook too."